Pongal is a popular four day long harvest festival celebrated in Tamil Nadu. It falls in the mid of January each year. It is a thanksgiving occasion to nature. Chakkara Pongal is a delicacy made of newly harvested rice. Nowadays we use raw rice instead of new rice. It is cooked with jaggery, ghee and cashew nuts and is offered to sun god. It is one of the easiest traditional dessert recipe that we can make with little effort. In most of the temples this sakkarai pongal is offered to god and distributed to people who visit the temple, in the name of Prasadam. Dry roast the dhal in a pan till light golden colour. Add 4 cups of water in the cooker, add rice and dhal. Cook for 3 whistles on medium flame. When steam escapes open the lid, mash the rice and dhal mixture slightly. Boil jaggery with a cup of water and boil till the jaggery dissolves well. If the jaggery is not pure, strain and then add. Now add the jaggery water and allow to boil the mixture. Add milk grated coconut (optional) and cardamom; mix well and cook for 2 minutes. Fry coconut pieces first in ghee then in the same ghee fry cashew, raisins together and add in the pongal. Note: Using milk in this recipe is purely optional. In temples they serve pongal without adding milk. You can increase the quantity of milk as per your taste. But the colour of the pongal turns lighter colour if you increse the quantity of milk. Select dark coloured jaggery which always tastes good and gives rich colour to pongal. 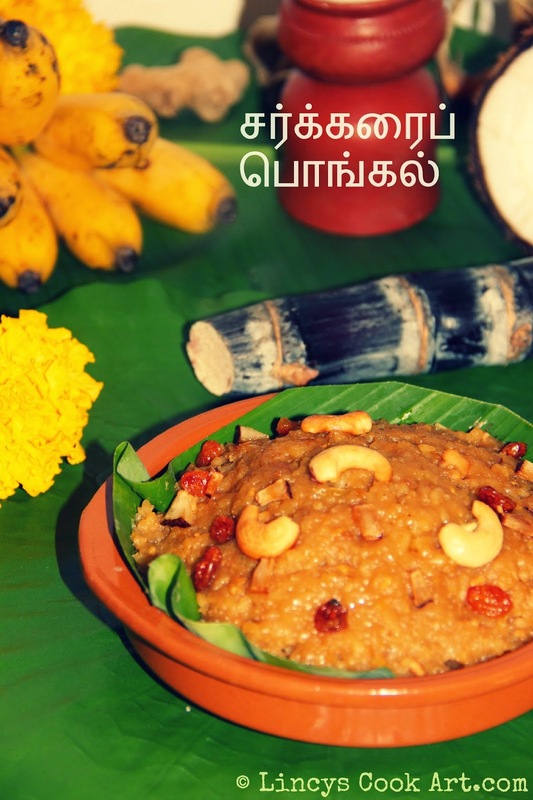 Click here to view Ven Pongal Recipe. Looks yum n nice click! Wonderful clicks. Delicious and lipsmacking good Pongal. Apt presentston for pongal and pongal looks very delicious. Good job lincy. Nice and beautifully made. I've made it before but for this year, lemme try your version. Beautiful pics n nice presentation,I love coconut pieces in pongal very much..